Patrick and his Eastview teammates were playing in the Blue Ox Hockey Bantam AA Tournament in Brainerd, MN. Patrick scored the game’s first goal and collapsed moments later on the ice. First responders were unable to revive him. It was later determined Patrick had numerous heart defects that caused his early death. 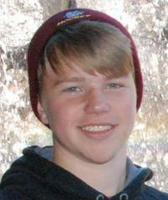 Patrick was a fun loving teenager who is loved and respected by many. Patrick was a gentle giant. He was the “anti-bully” at school and stood up for those who could not. He made kids feel welcome with his smile and kindness. He was a great teammate and brought laughter and life to the locker room. He will forever be missed but never forgotten, and his legacy will live forever through the Play For Patrick Foundation. Patrick’s heart condition was never detected during exams or physicals. The Schoonover family is working with the University of Minnesota Physicians Heart clinics to educate and inform families about heart defects and to help make heart scans more accessible and affordable. Patrick’s passing stopped the world of Minnesota Youth Hockey November 14th, 2014. It forever changed our lives, and we hope we can reduce or eliminate sudden death due to heart defects and save other parents from the pain and anguish we are feeling. Since August 2015, the Patrick Schoonover Heart Foundation has completed 15 Play for Patrick youth heart screens, screened 2,736 kids, found 157 with high blood pressure (with repeated check), 218 with abnormal electrical or structural heart defects, taught 2,512 kids & adults CPR & AED awareness and donated 6 AEDs to area High Schools.